Of the three World’s Fairs set in North America in the 1960s, the 1964 fair is the most memorable and oft-cited. It wowed the young generation of Boomers with technological wonders and forward-thinking ideas. It gave us a few of the most beloved Disney attractions. And yet, it wasn’t really a World’s Fair. Hopes an economic boom through tourism inspired the planning of the 1964-65 New York World’s Fair. Unfortunately, the Bureau of International Expositions (BIE) rules stated that only one exposition be permitted in any country within a 10-year period. Seattle hosted the World’s Fair in 1962. Plans for the New York fair were put into action anyway, without BIE endorsement and participation for most nations. The result was an exposition dedicated to American technology and innovation. Smaller and third world nations, including Ireland, Austria, Pakistan, and Vatican City, made up the international presence at the Fair. The rest of the fair was dominated by state and corporate pavilions. It was the corporations that brought the most awe-inspiring attractions to Flushing Meadows. General Motors updated their popular Futurama ride from the 1939 World’s Fair. IBM devised a unique theatrical experience involving an ascending grandstand and a multimedia presentation on the human brain. But one man’s contributions to the 1964 Fair have outlived most of the event’s attractions. Walt Disney brought visions and innovations to the fair that changed the way generations have thought about the world and their vacations. The Disney attractions were inspiring, uplifting, and unforgettable (no matter how hard we try to forget). Who can forget G.E.’s Carousel of Progress, Ford’s Magic Skyway, Illinois pavilion’s Great Moments with Mr. Lincoln? Who will ever forget that earworm nestled in the heart of the Pepsi pavilion It’s a Small World? 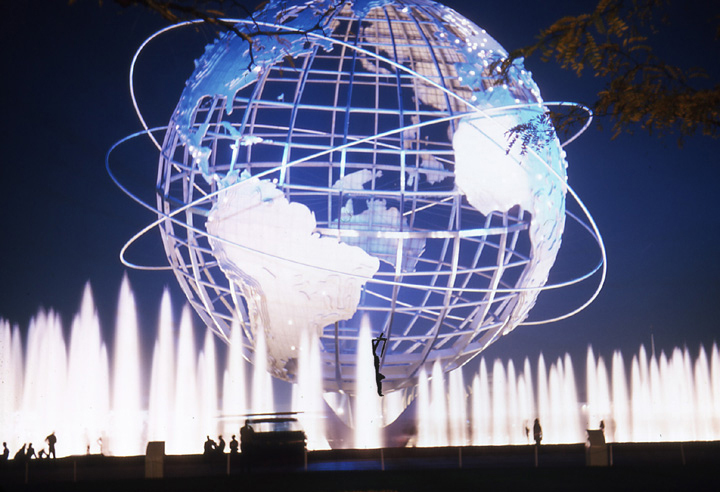 Despite running for two years, the 1964-65 New York World’s Fair was not a financial success. An estimated 51 million people were in attendance over the course of two summers, far less than the expected 70 million. Many of the pavilions and attractions were relocated and serve as landmarks and icons throughout the United States. The Disney attractions were transferred to Disneyland in California where some of the original pieces are still in use. Bonus: Take a look at this National Geographic feature on the World’s Fair and consider how many of those innovations have become a reality today.